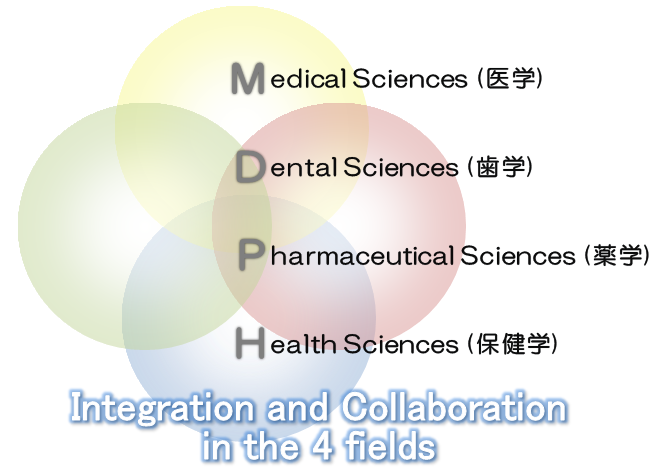 In response to social demands for functional improvements in healthcare services or issues, Hiroshima University has established “Graduate School of Biomedical and Health Sciences” in April 2019, with aims to further deepen basic research in the 4 disciplines; medical sciences, dental sciences, pharmaceutical sciences and health sciences, and to achieve greater integration and collaboration beyond the 4 fields. The Graduate School has established 2 divisions: Division of Biomedical Sciences (Doctoral Course) and Division of Integrated Health Sciences (Master’s Course and Doctoral Course). Division of Biomedical Sciences (Doctoral Course) aims to cultivate medical / dental practitioners and pharmacists who acquire leading clinical capabilities as highly specialized health professionals with research skills / comprehensive knowledge in medical care, and the personnel who have expertise in advanced life science research beyond the professions. Division of Integrated Health Sciences (Master’s Course and Doctoral Course) aims to cultivate those who can contribute to promotion of QOL (Quality of Life) and extension of life expectancy, and health science professionals who can take important roles in new medical service systems such as inter-professional collaboration and community-based integrated care. Graduate School of Biomedical and Health Sciences aims to nurture highly-advanced medical professionals who can take leading roles in advanced team health care, and promote the foremost educational research through deepening basic research, and collaboration / integration between the 4 disciplines ; medical sciences, dental sciences, pharmaceutical sciences and health sciences. Followed by the reorganization of Graduate School of Biomedical and Health Sciences from the former graduate school, conventional 5 Majors were restructured by 2 Divisions; Division of Biomedical Sciences (Doctoral Course) and Division of Integrated Health Sciences (Master’s Course and Doctoral Course), each composed of degree programs. ※Please see the chart for details of the reorganization. ■Division of Biomedical Sciences pursues to develop medical / dental practitioners and pharmacists who acquire leading clinical capabilities as highly specialized health professionals with research abilities / extensive knowledge in medical care, and the personnel who have expertise in advanced life science research beyond the professions. ■Division of Integrated Health Sciences aims to develop nurses, physical therapists, occupational therapists, dental hygienists, dental technicians, medical physicists, public health professionals, and life science researchers in biomedical sciences who can contribute to promotion of QOL (Quality of Life) and extension of life expectancy, and possess extensive knowledge on new medical service systems such as inter-professional collaboration and community-based integrated care. Closely collaborating with Graduate School of Integrated Sciences for Life, Graduate School of Biomedical and Health Sciences has established interdisciplinary degree programs composed of faculty members of the two graduate schools, “Program of Biomedical Science, Graduate School of Integrated Sciences for Life” and “Program of Biomedical Science, Graduate School of Biomedical and Health Sciences”, intending to promote the personnel capable of playing major parts in interdisciplinary fields or new fields besides medical disciplines. The collaboration with Graduate School of Integrated Sciences for Life encourages students to choose their vice academic advisors based on their research themes between the programs, or to take both classes by remote lecture system.